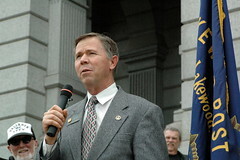 State Senator Kevin Lundberg represents Colorado State Senate District 15 which includes Loveland, Berthoud, Estes Park, Red Feather Lakes, Wellington, and all of Larimer County outside of Fort Collins. Senator Lundberg lives with his wife and youngest daughter on a farm near Berthoud. As a third generation Coloradan, Senator Lundberg owns and operates Lundberg Productions—a media and video production service—for the past 29 years. Senator Lundberg holds a BA degree from Rockmont College in history and social science. He served on the Board of Trustees for Colorado Christian University from 1986-2002, helped found Christian Home Educators of Colorado in 1990, sings with the Loveland Choral Society, and remains active with Galilee Church in Loveland. Senator Lundberg will continue to work tirelessly to lower the cost of health care for Colorado families while increasing accessibility and promoting specialized care for rural communities. Senator Lundberg is also dedicated to increasing school choice for Colorado families and believes education decisions should be made by parents and communities, not government bureaucrats. With a deep love for our beautiful state, Senator Lundberg backpacked all across the Colorado Rockies, including a 700 mile trek along the Continental Divide. In 1997, he fulfilled a lifetime dream of building a solar and wind powered home, which he and his family continue to live in today.